I’VE been very excited about this car arriving. It’s basically a Fiat 124 which has been to the Abarth finishing school. And when Abarth tinkers with any Fiat it usually means it’ll become louder, stiffer and faster. That’s all well and good when it’s a Fiat 500 that’s been fettled, but when it’s the already fun and sporty Fiat 124 that’s been turned up a notch, it promises to be an absolute scream. As excited as I am waiting for its arrival today, I’ve managed to refrain from standing at the window looking out for it and I’m engrossed in important work stuff when I hear the sound of something exceptionally rorty pulling up. There’s a speed bump outside my window so I often hear yobs slowing down in their completely ruined Hondas and Fiestas, but this sounds different. And, if anything, it sounds louder. I look outside and it’s the Abarth 124 arriving. “My neighbours are going to love me tomorrow morning”, I think to myself as I trot down to greet the driver. It’s in a fabulous colour. Dark, metallic grey with black wheels and some choice red bits, including the delicious Brembo calipers. The surprisingly tall delivery guy squeezes himself out and hands me the key, before heading off to his next collection. I can barely wait to take it out for a spin, but I’ve still got some important work stuff to do, so I park it up and it’s not until later on I get to drive it properly. My maiden journey in the Abarth is the mile-and-a-half trip across town to collect the wife from work. I’ve noticed it’s important to give it some revs when engaging the clutch – partly because it’s pretty easy to stall, but also because it sounds awesome. Beyond the childish noise it makes, I can’t say, during this brief run, it feels that different to the standard 124, but it certainly feels fun. I can’t wait to take it for a proper ride out tomorrow. IT’S a nice, winter’s day, so It’s the perfect opportunity to take the Abarth out and stretch its legs. Before I can head out into the Peak District, however, the wife reminds me we need to go shopping or we’ll run out of food and shrivel up and die, so I concede and go and play adult for a few hours. The cabin’s comfortable, but small. It’s a typical sports car in that respect. You sit low with your legs outstretched, the steering wheel’s upright and in the perfect place and the short gear nob is placed high up. There isn’t a glove-box, but you do get a useful lockable cubby between the two seats. The boot, on the other hand, isn’t as bad as you might think. Sure, you’re not going to fit a washing machine in it, but a few bags of Aldi groceries slot in with ease. We’d joked, on the way out, that we might need to cross toilet roll off the shopping list unless we wanted to sit with it between our legs, but there would have been no need. The boot’s perfectly decent. Shopping unpacked, I politely informed my wife that she might be about to see a grown man cry if I had to wait any longer to go out and play in the Abarth, so I spared her the tantrum and headed for the hills. First things first, let’s talk about that noise. 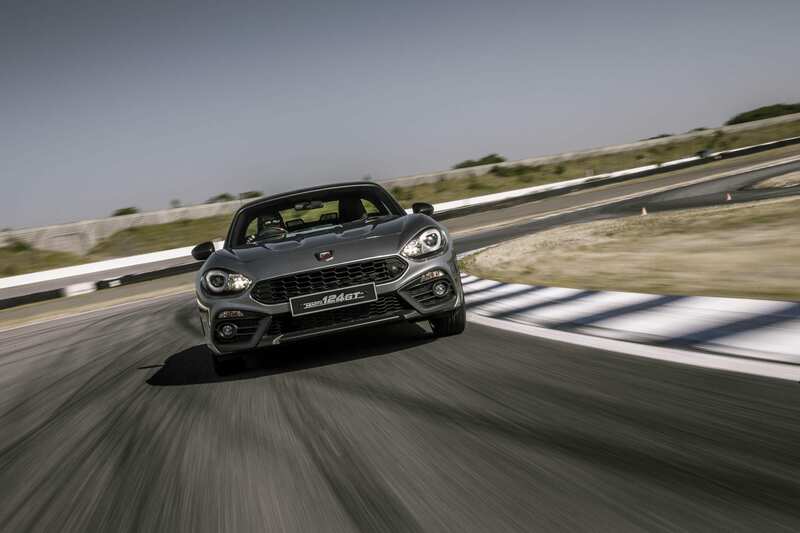 The Abarth 124 is fitted as standard with a quad-exit Record Monza exhaust, and it sounds fantastic. It is quite loud, but it doesn’t drone at speed. If anything it’s more raucous at idle, but it does pick up to a wonderful crescendo under load. It’s properly addictive. It’s something of a hallmark of recent Abarths, but you don’t seem to get a lot of the popping and banging I’ve seen in some of the hot Fiat 500 adaptations. Shame. Power is delivered by a 1.4-litre Turbo engine which develops 168bhp and 184lb ft of torque. The manual gearbox in my press car is a joy to use and the throttle is gloriously sharp, especially in sport mode. It’s not as rev-hungry as you might expect, but the turbo chimes in predictably, so it pulls away beautifully. The car weighs barely anything over a tonne, so 0-62 is dispatched in a brisk 6.8 seconds. A trick suspension setup and a limited-slip differential mean it’s an absolute hoot on the open road. It feels light, aggressive, cheeky and thoroughly entertaining. I arrive back home with the sort of smile on my face that might have suggested I was having an affair, but the wife’s just pleased to see me because the dog’s been sick and she’s about to burn the quiche. ANOTHER dry, sunny day, and I’ve got to drive to see some friends. 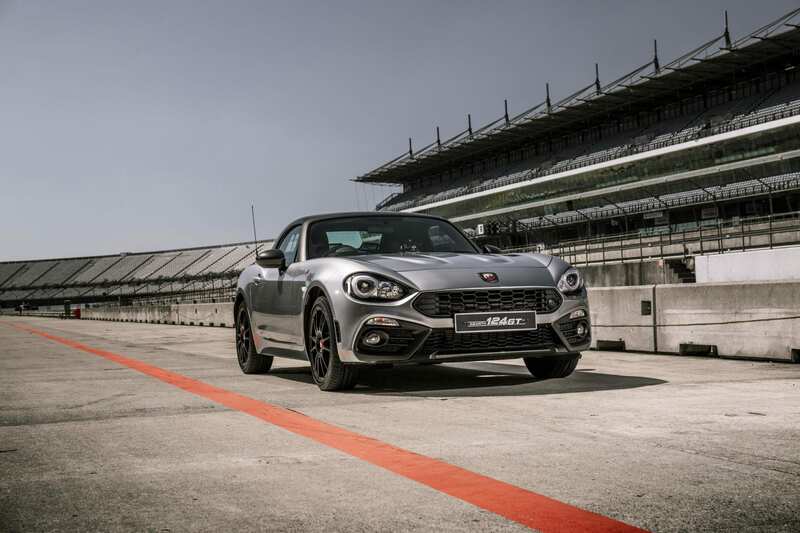 The car I’ve been sent is the latest incarnation of the Abarth 124, the GT, which isn’t all that different, save for the addition of a carbon-fibre roof. I’m told it’s detachable, by unscrewing six bolts, so I seek them out in a bid to enjoy some al-fresco motoring. Sadly Abarth didn’t send the car with a Torx spanner and I don’t have one at home. I’m guessing the press office isn’t keen on having the beautifully-made hard-top plonked on a journalists’ garage floor and roof-removal isn’t encouraged. I quickly give up on my plan. The GT’s roof is there to stiffen things up, apparently. And although it adds a bit of weight because the fabric mechanism remains in place, despite the lining it’s only 16kg. Whether it really does stiffen things up is something I’d probably only reveal on a race track, but it does squeak a bit, which is annoying. Perhaps the last person to test it didn’t fit it properly, I’m not sure. Thankfully, the exhaust does a wonderful job of drowning it out. BACK to the grindstone today. I let the wife take the car to work because I’m going to be stuck in the office all day. The first thing she does when she arrives at her desk is text me to declare her undying love for the Abarth. She’s a huge fan of sports cars. I can generally take them or leave them, but the 124 reminds her of the MGF she owned years ago. I gather she also enjoyed letting all her work-mates coo over it at lunch time. The last car she took up there was a Honda Jazz and that didn’t bat an eyelid, funnily enough. But the Abarth certainly does draw in some admiring glances. Truth be told this souped-up version of the 124 doesn’t look that different, but I do like its shape. I love the broad, bulging bonnet that you can see from the driving seat and I love the rear diffuser that tucks the four exhaust pipes away. It’s also available with a black bonnet, but I’m not sure I’d bother. I prefer its looks, incidentally, to its sister car, the Mazda MX5. The two cars broadly share an interior and many of the oily bits, but the styling is quite different. The Mazda does handle more sweetly, but I’ve always found the 124 to be the more grown up and civilised car. 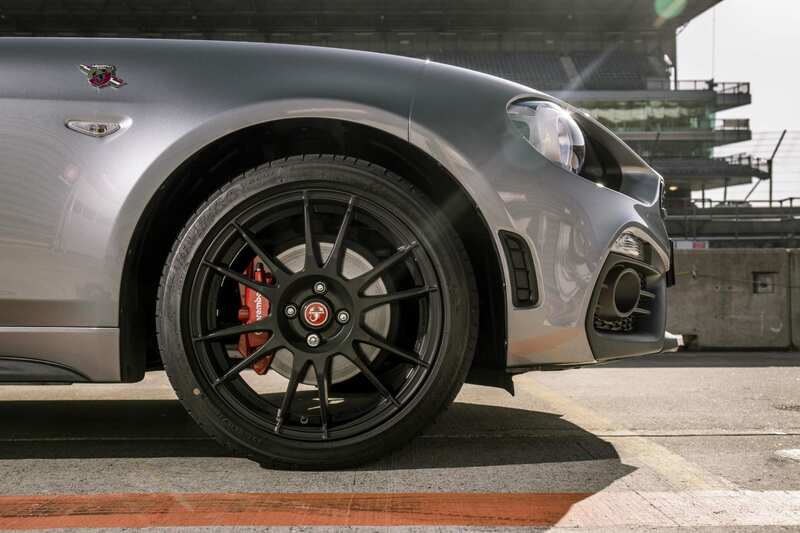 Abarth’s treatment doesn’t ruin that, but it does give it a boisterous charm. IT’S bitterly cold today and snow is forecast. Snow always seems to arrive when I’ve got a rear-wheel-drive car on test so I’m aware I’ll need to be particularly careful when I go out in the Abarth this afternoon. I’m very grateful for the standard heated seats, the decent heater, and the well-insulated roof. Given all the built-in silliness, the Abarth is a surprisingly nice car to live with. As I said, sports cars aren’t really my thing, but it is very easy to drive. Everything’s light and easy to operate, the seats are comfortable, visibility’s good and my MPG has been popping into the 40s. There’s a lot going for this car. Predictably, the snow’s coming down quite heavily as I head out so I take it easy. For a sharpened-up two-seater sports car the Abarth copes well on the wintry roads and, I have to say, I’m glad it feels so civilised. Having said that, arriving at an empty car park which had been coated with a dusting of snow, I did allow myself a moment of silliness. Well, you’ve got to, haven’t you? THE Abarth goes back tomorrow. It’ll be a sad day. I honestly expected myself to have grown tired of it by now, but actually completely the opposite has turned out to be the case. The wife almost shed a tear as I dropped her off at work in it for the last time and I reflected on my brief encounter with it on the way back home. I’ll be honest, I’m struggling to find things I dislike about it. The infotainment system is a bit basic and a nicely-specced GT costs around £30,000 – which, let’s not sugar-coat this – is very pricey. More than the MX5, certainly. But I love the way it sort of reminds me of a 1960s sports car. I’m thinking Triumph Spitfire with the broad bonnet, rorty exhaust and lively responses. All its really missing is the smell of hot oil and the incessant breakdowns. A roadster should be fun, and the Abarth delivers fun in spades. A roadster needn’t be easy to live with and pleasant to drive every day, but the Abarth is. 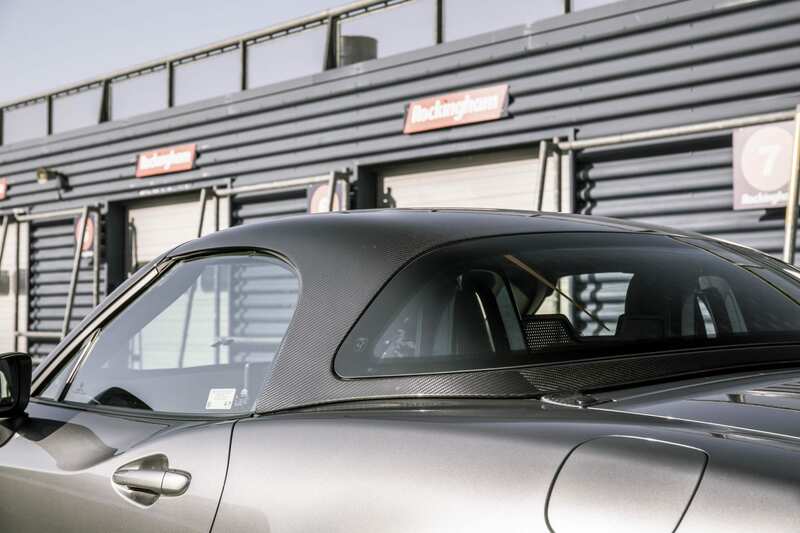 There are more thrilling cars, but if you want perfect handling, buy a second-hand Porsche Boxster. The Abarth entertains in a way I’ve not experienced in a sports car for quite a while. It offers all the things I like about a roadster, but none of the bothersome quirks and downsides. It’s one of the best roadsters I’ve driven in years and, in actual fact, it’s one of the best cars I’ve driven in years. I’ve always discouraged the wife from buying another sports car because we’d never fit the dog in it and I always find them hard work after a while. But if she came home in an Abarth 124 I’d be over the moon.